A. Build-An-Adapter is an application that allows astronomers to design a custom connection between any two DEVICES in just a few clicks. Using the application is easy: just select the devices to connect on each side, and specify the length of the connection. It is important to note that Build-An-Adapter is not an adapter catalog. We make custom parts designed and ordered online by customers, exclusively. PreciseParts does not design adapters nor do we sell off-the-shelf parts. Q. What do I need to know to design a custom adapter on your site? A. Our customers like to call Build-An-Adapter a "Computer Aided Design (CAD) for Astronomers" but no special skills are actually required to create adapters on our site, nor does one needs to know the connection or thread specifications for any of the astronomical devices listed on our site. However, to use our web app effectively one should be familiar with the function of each device in the optical train and with the basic physical and optical properties of the equipment to be connected. These characteristics include how each device connects and its respective back-focus. In addition, if the adapter, or adapters, are to integrate the components of an imaging train it is important to know the location of the system focal plane, the recommended distances, the clear aperture and the focal ratio of the optical system. These are often critical pieces of information to create appropriate adapters for a custom astrophotography setup. If unfamiliar with the terminology or unsure about back-focus or focal distances for a particular device we strongly recommend consulting the respective manufacturers or a reputable telescope dealer for recommendations and assistance prior to designing adapters on our site. Please consider that we custom machine each part as ordered therefore an adapter ordered at the wrong length or for the wrong device cannot be returned. Q. How do I specify a custom adapter with Build-An-Adapter? A. First only consider the devices the adapter will directly connect to. For example, if you need an adapter between a reducer and a filter wheel, you want to select the reducer on the scope side and the filter wheel on the camera side. The sides are always relative to the point of view of the adapter itself. It matters little what the particular telescope and camera are in this case, but observe that the DIRECTION OF LIGHT is indicated on the page by a red arrow and the light ALWAYS travels left to right in our application. This rule must be strictly adhered to as inverting light direction will produce an adapter with incorrect genders or features. Proceeding with our example, first you want to select on the left side the manufacturer of the reducer, for example Optec, and on the right side the brand name of the filter wheel, for example Finger Lakes then click Next to select the specific devices to connect left and right, for example Optec Lepus and FLI CFW-2 Series respectively, and finally typing in the center field the effective length required for this particular adapter, in either inch or mm. In many situations the length can be typed as 0 (zero) to produce as short a connection as it is mechanically possible. Please note however that a minimum length adapter is not always desirable and you want to check this answer if a specific effective length is required and you need assistance to calculate the length. The custom adapter design is displayed on the page as soon as the Build button is clicked. The price is informed in the right pane. The adapter designed can be viewed and rendered in 3-D with a recent browser, then finally, if the design matches what is expected, the part can be ordered online via the Add-to-Cart button at the bottom of the page. Q. I tried to use Build-An-Adapter but nothing happens when I click "Next"
To display the adapter design, your browser must also recognize HTML5 (aka Mozilla/5.x). All current versions of Firefox, Safari, Google Chrome, and Opera support HTML5, including the browsers available on most mobile devices such as iPhone, Android, Blackberry or iPad. Internet Explorer supports HTML5 starting with version 10. Please check this answer for more information. Rendering the adapter in Virtual Reality 3-D requires a browser compatible with WebGL. While most newer browsers supports WebGL by default, some browsers such as Safari on macOS require WebGL to be explicitly enabled. If you are using Safari please check this answer for assistance. A. If your astronomical device is not listed under its brand name, it may be available under the generic devices category located at the end of the pull-down menus on the first page. It is important to note that the selections listed represent the device or feature the adapter SHOULD CONNECT TO, rather than the feature required on the adapter itself. For example, if you need an adapter with a nosepiece you must select the device that nosepiece will CONNECT TO, generally a 1.25 or 2 inch adapter/focuser on the telescope side. These entries can be found either under a brand name or under "generic devices". Conversely, a 1.25 or 2 inch receptacle can be created by selecting a matching nosepiece on the camera side. If your device is not listed under any of the pull-down menus please email us a detailed description, including make and model number. We will then gladly add your device to our database if the connection specifications can be located. Q. Is there a cost to design a custom adapter online? A. Any number of parts can be designed online with Build-An-Adapter and the service is completely free. We even encourage our users to click the Build button repeatedely to create parts with various effective lengths or features as this can be very useful for trying different setups. You only pay when parts are placed in the Shopping Cart and the order is accepted by our payment processor (currently PayPal). Q. Do you have off-the-shelf parts available for quick shipment? A. No, we do not keep an inventory of parts. All the adapters we make are designed online by our customers with the features and length selected to specifically fit a particular application. We then custom machine the parts ordered. Q. What is effective length? A. An adapter's Effective Length is defined as the distance the adapter adds to the optical path, or equivalently, this the back-focus the adapter consumes from the image train. This distance value is also called Optical Length. Q. Does effective length include threads? A. One of the benefit of using Build-An-Adapter is there is no need to consider threads or other connection features to calculate a custom adapter effective length. Build-An-Adapter takes care of these details and creates a part with appropriate dimensions such that the finished adapter optical length ends up exactly as specified. The 2D adapter drawing displayed on the Build page shows precisely where the adapter effective length is measured from. If one wishes to dig deeper into the matter, here are the ugly details: conventional male threads do not contribute to effective length while conventional female threads are an integral part of the effective length. But unfortunately there are exceptions to this seemingly simple rule, most notably for SCT rear cells which present a male thread to mount a visual back or an imaging system. The length of this SCT thread is NOT included in the length of any adapter designed for one of these telescope rear cell. Or in other words, the back-focus on a SCT is always measured from the TOP of the male thread at the rear of the scope. This is the reference point SCT manufacturers use to measure focal distance. The above rule is also applicable to Meade ACF and Celestron EdgeHD instruments, as well as a few other, less common, optical devices. Although this is clearly not the conventional way to measure back-focus, Build-An-Adapter is smart enough to take these peculiarities into account when calculating an adapter actual length, so you do not need to. The bottom line is that ONLY the desired NET adapter optical length needs to be specified in Build-An-Adapter. This is precisely the definition of the term Effective Length. Q. How can I figure out the adapter length required? A. The Adapter Effective Length is the net distance the custom adapter will add to the optical path. If you are designing a SLR or DSLR lens adapter for an astronomical camera, please consult this answer. If you need an adapter consuming the minimum possible amount of back focus, just enter 0 for the Adapter Effective Length to let Build-An-Adapter calculate the shortest possible adapter that will connect the devices selected. The actual, calculated, length will be displayed in the length field after the Build button is clicked. The length is displayed in inch or mm depending on the unit selected. The calculated value may or may not actually be zero; the minimum length is constrained by the specific connection features required for this particular adapter. Always check the 2D drawing displayed on the Build page for a visual confirmation of how the effective length is measured. When designing a custom adapter for a photographic lens, or for the camera side of a field flattener or reducer, it is important to note that a minimum length adapter will almost certainly be inadequate: to reach focus or produce a flat image field, a flattener, reducer, or lens must be located at a precise Optical Distance in front of the camera CCD. The recommended Optical Distance for a reducer/flattener is also known as the Metal Back Distance and the value is generally supplied by the device manufacturer. For example, if you have a flattener that requires an Optical Distance of 55 mm and you want to connect a camera having 17 mm of back-focus to that flattener, your Image Train Back Focus is simply 17 mm and you will need a custom adapter with an Effective Length of 38 mm (55 minus 17) to end up with the correct spacing for that flattener. If there is a filter wheel and/or other accessory in our image train between the reducer/flattener and the camera, the thickness of each accessory should also be taken into account in our calculations. The Image Train Back focus is then the sum of these components thicknesses and back-focus, then as before we use the formula above and subtract the total Image Train Back focus from our Optical Distance. Additionally, if there is any glass filter installed between the reducer/flattener and the CCD (perhaps inside a filter wheel), the effective length may need a small correction to take into account light diffraction through the filter glass: each 3 mm of glass thickness INCREASES the Optical Distance by about 1 mm and the correction must be ADDED in the formula, therefore increasing the Adapter Effective Length by the same amount to compensate for the glass correction. In our sample image train with the 17 mm back-focus camera, if we install a filter wheel that has a thickness of 25 mm equipped with 3 mm thick glass filters, our total Image Train Back-Focus sums up to 42 mm (17 plus 25) and the Adapter Effective Length is now 14 mm (55 minus 42, PLUS 1 mm for the filter correction). Q. Build-An-Adapter says my adapter is too long. A. Generally, a custom adapter should be less than 3 inches (75 mm) in effective length. If the particular application requires a longer adapter to reach a specific distance, we recommend inserting additional components, such as a standard extension tube, in the optical path to shorten the gap the custom adapter will need to bridge. Please also consider that the price of a custom adapter rises VERY rapidly as the length increases. The vast majority of custom adapters we make are less than 1 inch in length. Q. Can you verify whether the length I am ordering is accurate? A. We may be able to verify whether an adapter length is reasonable if we have the devices back-focus and distances on file, but we do NOT have information for all devices and it is important to note that PreciseParts is no authority regarding these values. Always double check recommended values with the respective manufacturer if any question or concern about distance and back-focus. If we do happen to have the information we will do our best to help. Please contact us with the adapter reference number obtained online and a complete list of devices in your image train, including the type of filter installed, if any. Disclaimer: Please be aware that the adapter length ordered is ultimately the customer responsibility and we cannot be held liable for an adapter length that ends up inappropriate for a particular application. Q. Will the adapter be strong enough if I select the minimum length? A. An adapter strength bears little relation to its length. All our custom adapters are automatically designed with enough metal thickness to support the loads the connected devices are designed for, and to provide the needed rigidity for such applications. Q. Can Build-An-Adapter automatically calculate the correct length for my adapter? A. No. Build-An-Adapter does not have enough information to accurately determine the length. The only exception is for minimum length when Build-An-Adapter automatically calculates the shortest possible adapter when 0 is typed in the length field (noting that 0 is not an acceptable value for a DSLR lens adapter - check this answer). A minimum length adapter however may not be adequate for a particular application and it is critical to be fully familiar with one's optical setup to be able to determine an appropriate length for the adapter. Q. Why cannot I specify a shorter length if the graphics seems to show it's possible? A. Build-An-Adapter automatically calculates the shortest possible length for a custom adapter if 0 is entered in the effective length field. If the actual, calculated, effective length seems high, the device to be connected probably requires some kind of clearance, preempting the adapter to be made shorter. This clearance is frequently revealed on the adapter drawings by a step or shoulder machined at the maximum diameter which would still clear the device. A. Please verify that both sides have devices selected and that a length value is entered, noting that zero can be used as the length in most cases to produce the shortest possible path length compatible with the connections selected. If all fields have a selection but an error is still displayed, we will generally supply detailed information spelling out the exact cause of the error together with some possible alternatives. It is therefore important to read the entire message. However if this still makes no sense please contact us with the error message number shown in brackets and a description of the adapter you are trying to design. Please be aware that Build-An-Adapter may sometimes be unable to create the desired part due to certain types of mechanical constraints such as described in this answer. Q. Build-An-Adapter says the length I entered is not sufficient to make the part. A. Most adapters need a certain minimum effective length so they can be built. The minimum length essentially depends on the features required to make the desired connection. This minimum length is automatically calculated if 0 is entered in the Effective Length field. The adapter will be made with the the shortest possible effective, or path, length. The actual length value is then displayed in the Effective Length field in either inch or mm, depending on the unit selected. This calculated value will be useful to subsequently determine the total length of an image train. However note that Build-An-Adapter is not able to calculate a minimum length for a lens adapter. Check this answer if you are designing a custom adapter for a SLR/DSLR lens. Q. Build-An-Adapter says the adapter "is not possible" or "cannot be built". A. Certain custom adapters cannot be created as a single piece. Typically custom adapters requiring a bolted flange at both ends are not possible. Also if an adapter is bolted at one end, the feature at the other end cannot have a diameter value too close to the diameter of the bolt circle since this would prevent drilling the holes or installing the screws. There are also other constraints when building a SLR/DSLR lens adapter for an astronomical camera. Please see this answer if you get an error trying to create such an adapter. Q. Build-An-Adapter says "An extension tube with this specification is not available". A. An extension tube requires a pair of complementary features, for example a male thread and its matching female. However sometimes we do not have specification in our database for one of these feature so an extension tube cannot be designed for this particular connection. It is sometimes possible to add the missing specification thus always consult us if you get this error and we will do our best to add any missing information and allow the needed extension tube to be created. A. Generally, a custom adapter should be less than 3 inches (75 mm) in effective length. If the particular application requires a longer adapter to reach a specific distance, we recommend inserting additional components, such as a standard extension tube, in the optical path to shorten the gap the custom adapter will need to bridge. Please also consider that the price of a custom adapter rises very rapidly as the length increases. The vast majority of custom adapters we make are less than 1 inch. A. Please be sure to click the Build, or Build Again, button just once but if the error persists the problem is probably with the browser. Certain versions of Internet Explorer and Edge, in particular IE rev 11.0 and Edge/16 or 17, generate a double-click by themselves when any action button is single clicked. Unfortunately there is no easy work-around for this issue and we recommend using another browser to access our site until the IE/Edge issue is fixed. Q. I have a technical question about a particular device. Can you help? A. Unfortunately we are not able to assist with device questions. Our familiarity with astronomy equipments is generally limited to their mechanical connectivity. We recommend consulting the manufacturer or an astronomy dealer for detailed information about a particular device. A. Please be sure to check the full list of devices available in Build-An-Adapter. First search under the device brand name, then if the name is not listed, check the other brand names category located at the end of the drop down menus on the first page. The other brand names category lists less common names and devices. Lastly, if you believe your device uses an industry standard thread or feature, please check this answer. It is important to note that the selections listed represent the device or feature the adapter SHOULD CONNECT TO, rather than the feature required on the adapter itself. For example, if you need an adapter with a nosepiece you must select the device the nosepiece will CONNECT TO, generally a 1.25 or 2 inch adapter/focuser on the telescope side. These entries can be found either under a brand name or under "generic devices". Conversely, a 1.25 or 2 inch receptacle can be created by selecting a matching nosepiece on the camera side. Our database is very comprehensive and encompasses the vast majority of astronomical devices, past and present, but if after exploring all the suggestions above you still cannot find your particular device in the lists please contact us with a detailed description, including the make and model number. We will gladly add your device to the database if the connection specifications are available. Alternatively, if you know or can measure threads or other connecting features on the device, we might be able to add an entry in Build-An-Adapter based on that information together with the complete device name and description. Please be aware that if you supply the thread specification the part will be made at your own risk and we cannot be held responsible if it does not fit. Q. My device seems to match several possible selections. Which one do I chose? A. First be sure to select the exact device rather than a generic feature. It is always safer to select the brand name device if that device is listed (check this answer for further details). Many devices have similar designations, but sometimes different connection methods. It is therefore very important to make sure you are selecting the correct device. Check with your dealer or the device manufacturer if any doubts. You can also email us before placing an order to confirm whether the device you selected is the correct one. Please make sure to include the reference number obtained online in Build-An-Adapter. Regarding device designations in our pull-down menus: we always try to describe devices using the same terminology as the manufacturer thus please consult the device manufacturer or your dealer if you are not sure how the device is called. Some manufacturers, such as Takahashi, provide detailed system charts with precise component designations, and we strongly recommend checking your particular telescope system chart in case of doubt. If your device is listed with several connection options, such as bolted or threaded, and you have the device in hands, you want to visually examine the device to verify the type of connection it came with, noting that the terms "bolted" or "threaded" refer to the way a custom adapter is installed on the device. A number of astronomical cameras and accessories are supplied with various optional faceplates or mounting hardware to accommodate several different installation methods. Other cameras come standard with various mounting options, and the most appropriate connection will depend on the particular imaging setup. While most mounting alternatives should provide adequate connections, some connection methods have limitations or restrictions. For example, if available, a dovetail connection is usually preferable to a bolted or threaded connection since the former allows angular adjustment of the image train, however if the telescope offers other means of rotating the imager a bolted connection, when mechanically possible, may be more rigid and usually consumes less back-focus. A threaded connection on the other hand will generally produce the least costly custom adapter if the device offers that option. Q. How can I be sure a custom adapter will fit my devices? A. We stand behind our design and will promptly replace or rework a custom adapter if it does not fit either device, or if the part length does not match the effective length ordered within a reasonable tolerance. Please also check our warranty statement here. Q. Can Build-An-Adapter check whether I am ordering the correct adapter for my devices? A. The Adapter Builder generally does not have enough information to verify the suitability of an adapter for a particular application, although we do generally review most orders and will flag potential inconsistencies based on our knowledge of astronomical equipments. We will contact you in such situation but you may want to contact us preemptively if any doubt or concern about the adapter design, noting that the vast majority of connecting issues can be prevented by simply examining the adapter drawings (displayed in both 2-D and 3-D) before placing an order. Q. The feature I want to connect is an industry standard. What brand name do I select? A. Most industry standard, non brand name, connections can be found under the generic devices category located at the end of the pull-down menus on the first page. Please note however that we do not recommend selecting the generic version if your device is listed under a brand name. If a generic thread is selected instead of the actual device, you order at your own risk as we are not able to guarantee the adapter will fit under all circumstances. Most manufacturers use some proprietary variations in thread specifications and we can only abide by these special measurements if we know the exact device the custom adapter is intended for. Q. I know my device has a standard thread, can't I just select a generic version? A. We recommend against selecting a generic thread if the device to be connected is listed in Build-An-Adapter under a brand name. If a generic thread is selected instead of the actual device you order at your own risk as we are not able to guarantee the adapter will fit under all circumstances. Also, many devices have standard threads but require adapters with special morphology to prevent mechanical interferences. Manufacturers may use proprietary variations in thread specifications and we can only abide by these special dimensions if we know the exact device the custom adapter is intended for. Q. I have thread dimensions or a drawing for the part I need. Can you can make an adapter based on this information? A. No. We only make adapters to connect actual devices for which we have complete thread specifications on file. We cannot make a part based solely on a customer supplied drawing or thread measurements. We recommend first exploring the full list of devices available in Build-An-Adapter. Our database is very comprehensive and encompasses the vast majority of astronomical devices, past and present. Please be sure to also check the other brand names category, and lastly the generic devices category. Both categories are located at the end of the drop down menus on the first page. If your particular device happens not to be listed at all please let us know and we will be happy to add it to our database if connecting information is available and is within our machining capacity. Q. How can I mount a 35 mm DSLR camera on my telescope gear? A. A custom adapter is not normally needed to mount a 35 mm DSLR camera on a telescope. Mounting this type of camera is best accomplished with a simple adapter known as a T-Ring, or T-Mount, that is easily installed on the standard T-adapter supplied with most telescopes. T-Rings are available to fit practically all brands of 35 mm DSLR cameras. T-Rings can be purchased at most camera and telescope dealers for a few dollars. If your telescope did not come with the male t-threaded or M48 adapter needed to install the T-Ring (this is rare) then a custom adapter between the telescope and the T-Ring can be created in a few clicks in Build-An-Adapter: Just select the last device before the camera in your image train on the Telescope Side, and DSLR T-Mount/T-Ring or DSLR Wide T-Mount on the Camera Side. These connections are available under the DLSR camera brand name or under Generic Devices if the specific camera brand is not listed. Note that a 35 mm format DSLR camera equipped with a T-Ring ALWAYS has a back-focus of 55 to 56 mm. Check this answer if you are not sure how long an adapter for your T-Ring needs to be. Q. Can you make adapters for solar filters? A. We can make custom adapters for a variety of solar filters if the telescope features a threaded lens cell or a threaded dewshield. You want to select the solar filter on the TELESCOPE side and the telescope objective or dewshield on the CAMERA side. Although this seems counterintuitive these selections do respect the left-to-right "direction of light" rule used throughout the Build-An-Adapter application. A solar filter adapter can generally be designed at minimum length. Typing 0 in the length field will produce the shortest possible adapter. Please note that in the interest of safety and cost, we DO NOT make so-called slip fit multi-thumbscrews adapters some manufacturers use to install solar filters over unthreaded dewshields. Most telescope lens cells are threaded although sometimes a "beauty ring" must be removed to expose the thread. We have specifications on file for many telescope lens cells but if your particular instrument has a threaded cell and is not listed in Build-An-Adapter on the CAMERA side please let us know and we can try to obtain appropriate specifications to add the lens cell in our database for online access. Q. My device requires clearance to prevent interference. Does Build-An-Adapter take this type of requirement into consideration? A. We are aware that a number of devices, such as some cameras and guiders, have irregular or non-flat mounting surfaces and may have a section of housing, a guide port and/or associated helical focuser that can potentially prevent installing an adapter unless the adapter provides special clearance. Build-An-Adapter takes the needed clearance into account automatically for most known potential interferences and the clearance is usually reflected in the 2-D or 3-D drawing displayed online. However if adapter interference is suspected for a particular device and no clearance is shown in the drawings we recommend confirming with us prior to ordering. Please note however that we provide automatic clearance only for the device the adapter is directly connected to, and this specifically excludes secondary clearance issues where some accessory might produce additional interferences when mounted on a particular device. Q. My device requires a special thread. Does Build-An-Adapter takes this into account? A. We have detailed specifications in our database on all devices listed in Build-An-Adapter. These specifications include the exact thread morphology required for each device. For examples some devices require threads machined shorter than normal to prevent interfering with internal mechanisms, while others require longer male threads to reach a recessed internal thread present on some devices. Q. My device comes with several adapters but not all these options are listed in your app. A. As a general rule we only list "native" device connection(s) to prevent clutter and confusion. If other connection alternatives are supplied by the device manufacturer these connections are usually industry standard and most probably listed under the "generic devices" category. Q. Can you make a dust cap or plug to fit my device? A. A dust cap can be created for almost any device or feature. First select Dust Cap on the side the dust cap should be installed, then select the device to plug on the other side. The "dust cap" selection is located at the end of the pull-down menus on the first page. For example if you need a dust cap for your camera you want to select the specific camera on the Camera Side and Dust Cap on the Telescope side, but if you need to cap the device WHERE THE CAMERA IS CONNECTED you must select THAT device on the Telescope Side. There is generally no need to specify a length for a dust cap since Effective Length has no meaning for a cap so the value is defaulted to 0 (zero) to produce the shortest possible dust cap compatible with the device. This length is generally perfectly adequate while minimizing part cost. Please note that while all custom adapters are made from aluminum, we custom machine dust caps from black Acetal (aka. Delrin), a tough engineering plastic that looks like black anodized aluminum and matches the appearance of most telescope accessories while ensuring a tight seal. Q. I just need an extension tube. How do I specify that? A. First select the device or feature the extension tube will connect to, on either the Telescope or the Camera side, then select extensions and spacers -> Extension Tube on the other side. The "extensions and spacers" category is located at the end of the pull-down menus on the first page. Note that we define "extension tube" as a connector with opposite genders at each end. For example a threaded extension tube has a male thread at one end and the matching female thread at the other end. Most, but not all, kinds of extension can be designed online. Q. Can you add a provision to install a filter inside the adapter? A. We can add an internal thread in a custom adapter. The most common purpose is to mount a filter but the thread can have other purposes. It is important to note that the adapter must be large enough to provide room for the desired filter. In most cases there is an extra charge for the filter addition, billed separately via PayPal after we receive your online order. Please first place an order for the adapter with the needed connections then add a note in the comments field on the order page indicating the filter size, or email us the same information together with the order reference number (or the part number if you are ordering more than one part). A filter add-on is normally provisioned on the camera side, except for a nosepiece where a filter thread is machined in the conventional location, but if the filter thread needs to be added at a more specific location then you want to supply that information as well. Provisioning for an UNMOUNTED filter is also possible but require ordering an extra retaining ring to hold the filter. A retaining ring is easily created by selecting lock/retaining ring (under extensions and spacers) on the scope side and the appropriate filter size on the camera side (please check this question for details or search for keyword "retaining ring"). It is also important to let us know the exact diameter of the unmounted filter in the request. A few other small changes in a custom adapter can be requested the same way but some exceptions do apply, such as	substantially altering the part dimensions or changing the connecting features. Consult us in case of doubt. Q. I need a lock ring or retaining ring. How do I specify that? A. A Lock Ring is a female threaded ring to be inserted between two devices to secure the devices at a certain distance or at a certain angle, while an example of a Retaining Ring is a male threaded ring used to secure a lens within a cell or a filter frame. To create either part, first select the device or feature the ring will connect to, on the Telescope or the Camera side (the side selected will determine whether the ring is threaded male, a lock ring, or female, a retaining ring), then select extensions and spacers -> Lock Ring on the other side. Noting that the "extensions and spacers" category is located at the end of the pull-down menus on the first page. For example selecting a generic T-thread on the Telescope Side produces a female threaded lock ring. For an example of a male threaded ring select a generic filter on the Camera Side, and again extensions and spacers -> Lock Ring, but this time on the Telescope Side: note that the part produced is a retaining ring of the type used to hold a glass filter in a filter cell, or for securing a lens in an optical tube. Our Virtual Reality 3-D rendering is best to show details in thin parts such as retaining rings. Zoom the display by scrolling or pinching. Lock rings and retaining rings are normally made at minimum length (by specifying a length of 0) but can also be made a little thicker to improve grip, particularly on female threaded lock rings. Most, but not all, types of lock rings can be designed online. Female threaded lock rings are generally knurled while male retaining rings have spanner slots or holes to facilitate installation and removal. Q. I just need a simple washer or spacer to adjust image train distance. Can you make this? A. First select the device or feature the washer must be installed over. Then select Washer/Spacer on the other side. Washers are under the "extensions and spacers" category at the end of the pull-down menus on the first page. Lastly select the desired thickness for the washer. Please be careful not to make too thick a washer as the length of thread available on the device to be spaced-out must be taken into consideration. Most washers are made 1 to 2 mm thick (0.040 to 0.080 inch) at a maximum to leave enough free thread on the device so the latter can still be safely threaded with the washer installed. If you need a long spacer an extension tube will probably provide a better solution. We can make washers as thin as 0.5 mm (0.020 inch). 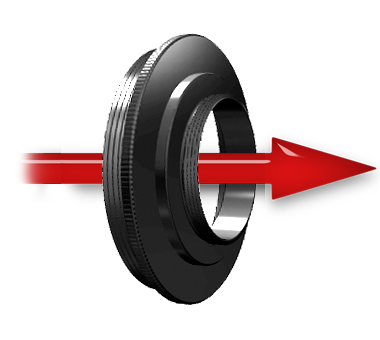 As a practical example selecting a generic T-thread on the Telescope Side produces a washer with the appropriate inside diameter to slip over a standard T-Thread. Please note however that as a general rule we do not recommend adding washers in an image train as any additional interface can potentially jeopardize orthogonality, promote flexure, and decreases rigidity. It is normally desirable to install the minimum possible number of parts in an image train. Our Build-An-Adapter web app allows designing custom adapters at almost any length. This results in very accurate spacing while avoiding stacking unnecessary components. Q. Do you supply the screws with a bolted adapter order? A. We supply appropriately sized stainless steel screws with bolted/flanged adapters. Screw holes are countersunk or counter-bored to hide screw heads when the application requires a flat surface (noting that the countersunk/counter-bore is not displayed in graphics renderings). We do not supply screws with an adapter featuring a flange with tapped holes as we have no reliable way to determine the most appropriate length for the screws, and usually the screws are supplied with the device. Note that the graphical representation of tapped holes is a little simplified and does not show the threads. Dovetail pocket (or receiver) adapters come with three soft tips setscrews. Alternatively a specific type of screw can be requested when ordering the part. Note: only the approximate locations of screws holes are shown on the 2D drawing. Please refer to the Virtual Reality 3-D Rendering for a more accurate rendering of bolt and screw holes. Q. Can the adapter be knurled to facilitate installation and removal? A. The outer diameter of a threaded adapter is knurled by default provided the edge is thick enough. A knurl can only be made on an edge that is at least 2 mm thick (or 0.1 inch or so). If the edge is too thin for a knurl we will add two spanner wrench holes or slots to assist in assembly or disassembly. Bolted adapters or adapter without thread (for example with dovetail discs at both ends) are never knurled. Q. Will the adapter have spanner holes or slots? A. Adapters too small or too thin to be knurled will have appropriate spanner wrench holes, or, if there is insufficient room for holes, two spanner slots at 180 deg will be provided to assist in installing and removing the adapter. Thin retaining rings have two spanner slots by default. Spanner holes or slots are added automatically when needed and do not need to be requested separately. Q. Is there a way to specify a rectangular piece in Build-An-Adapter? A. Only cylindrical parts intended for inserting in an optical path can be designed with Build-An-Adapter. Q. Can you provide an inner brass compression ring with a slip fit adapter? A. A brass ring can be supplied for some slip-fit adapters. This feature is not normally included but can be added to the order for an additional charge. Expect about 20% extra over the cost of a simple adapter. Please add a note on the order page requesting the brass ring, or email us to that effect indicating the order number. The extra fee will be billed separately via PayPal. Q. I need an adapter with anti-reflective surfaces. A. Our adapters have finely ribbed internal surfaces and in addition receive a deep anti-reflective layer, while outside surfaces are anodized smooth black. These are standard features on all PreciseParts adapters. Q. I need to add a lock ring on the adapter. Can the male thread be made longer to make room for the ring? First place an order for an adapter with the appropriate connections and an effective length THAT INCLUDES the amount of ADDITIONAL thread length the adapter should have, then add a note under "Note to Seller" on the PayPal payment page, indicating the ADDITIONAL thread length required. Or email us the same information after placing the order, indicating the order reference number or the part number. For example one needs a 10 mm effective length T-threaded adapter with a 12 mm long male thread: a standard male T-thread is normally made approximately 5 mm (0.200 inch) long but if the male thread must be 12 mm long instead the adapter must be ordered with an effective length 7 mm longer than actually required, or 17 mm in this case, to account for the extended thread. In most cases there is no extra charge for the extended thread, but if there is a charge it will be billed separately via PayPal after we receive your online order. (Noting that a lock ring can be ordered online as well. Please check this answer for details). A. If the graphics area on the left side of the build page is blank, your browser is probably outdated. You may want to check for a newer version, or alternatively use another browser. If a message is displayed instead of the adapter drawing, your browser does not support HTML5. HTML5 is required to display the design drawing in our Build-An-Adapter web app. We recommend using a current version of Firefox, Safari, Google Chrome, or Opera. The browsers available on most mobile devices, such as iPhone, Android, Blackberry or iPad, also work well. Internet Explorer supports HTML5 starting with version 10. We strongly recommend against ordering a custom adapter without checking the drawing. The drawing provides a visual confirmation that the part will be made with connections compatible with your devices. Q. Why are there no numeric dimensions on the drawings? A. Dimensions are not explicitly displayed on the drawings since most dimensions are not in the public domain and some equipment manufacturers may consider these values proprietary, however the 2D adapter drawing does show how the effective length is measured as this is usually the most critical numerical value for an adapter design. It is important to note that all other dimensions such as diameters and thicknesses are displayed in the drawings with correct proportions to help confirm that the adapter as designed will provide the appropriate connections for the selected devices. Please also check our warranty statement here. If questions remain regarding the exact dimensions of a particular adapter, we will gladly address these via email, but please be aware that we are not able to inform the thread specifications for a particular device (for the reasons outlined above) although we can certainly confirm, or deny, a specific thread information via email. Please contact us before placing an order in case of doubts of concerns. Q. The part shown in the graphics seems to be slightly different from what I expected. A DSLR lens adapter consists of two sections but only the camera side section is displayed in the 3-D view. Please refer to the 2D drawing for this type of adapter as the latter is rendered completely. Bolts and screws holes are only shown in Virtual Reality 3-D view, while the 2D drawing just shows their approximate locations. Some dovetail disks and grooved nosepieces are represented a little simplified in both the 2-D and 3-D drawings therefore the grooves may look slightly different on the drawings compared to the finished product. Tapped or countersunk holes in a flanged adapter are displayed the same as smooth holes. We may remove some additional metal during manufacturing to lighten parts, particularly in bulky adapters where very thick walls are normally unnecessary. A few devices require a flange with slots but the 3-D rendering might show simple holes instead of slots. However you can rest assured that we have the exact specifications from the manufacturer on file and we machine all features accordingly. Q. I see a male thread on the drawing where I am expecting a female (and conversely). A. When selecting a generic feature, please be sure you select the gender of the device to be connected rather than the gender you want on the adapter. If a particular device is selected and the thread does not seem right, please first confirm you have selected the device on the correct side, as selecting a device on the wrong side is the most common cause of inverted gender, but if you have confirmed the side and the gender still does not seem right please let us know and include the reference number obtained online; we will then gladly review our device specifications. Q. My mobile device does not show the 3-D rendering very well. A. Most mobile devices are slower than desktop or laptop computers and some have difficulties displaying the 3-D model interactively. On a small screen device such as a smart phone it helps orienting the device in portrait mode before starting the 3-D view as this prevents cutting off part of the 3-D graphics. The Virtual Reality 3-D does work better than our regular 3-D on an iPhone but iOS version 8.1 or later is required as earlier versions do not support WebGL. If only a blank window appears when selecting the Virtual Reality 3-D model on an iPhone or iPad with iOS 8.x or newer, try flipping your screen back and forth (from portrait to landscape, or vice-versa) but first you want to make sure the current orientation is not locked. The 3-D rendering should then show properly. As an API for the World Wide Web, WebGL necessarily conforms to the security principles of the web platform, and was designed with security in mind from day one. Check the Khronos site for more information. Q. The adapter shown in the graphics has a seemingly unneeded extra shoulder or step? A. The device to be connected probably requires some kind of clearance, which may translate to a step or shoulder machined at the maximum diameter which still clears the device. If the device is on hand you want to check for any protrusion or obstruction which would limit the connection diameter. This type of obstruction is frequently found on filter wheels where the electric motor gets in the way for larger diameter connections. Q. Why is the cost higher than the price of a similar commercial part? A. The cost of a one-of-a-kind, custom made part will always be considerably higher than an off-the-shelf part manufactured in volume since the latter is produced through a less labor-intensive process. PreciseParts excels in machining precision components that are either too specialized to be economically mass-manufactured or that are no longer available from their original suppliers. Q. The custom adapter costs more than I expected. A. Some features can increase the cost of an adapter dramatically. For example a long adapter with a large difference in internal diameters at each end will most likely require machining the part from solid aluminum stock, making the price considerably higher than machining a short part from tube stock. The vast majority of custom adapters we make in larger diameters (eg. 4 in / 100 mm or more) are shorter than one inch (25 mm) and if your particular adapter requires a longer length, first you want to check if some standard off-the-shelf components such as extension tubes, thread reducers, or step-down rings, can be inserted in the image train to help reduce either the custom adapter length or its diameter, or both. Another effective strategy is altering the sequence of existing components in the image train to minimize both the length and diameter differences in a custom adapter. These simple steps will most likely help drop the cost of the custom adapter substantially. A. The easiest way to order and pay for a custom adapter is to click the Add to Cart button at the bottom of the price page. A secure PayPal page will be displayed with a description of the item(s) ordered. Payment can be completed with either a credit card or through a PayPal account. Please make sure you include an accurate email address if paying with a credit card. We will email an order acknowledgment within one business day of receiving your order and will also provide a firm ship date. Payment by check or money order is also possible for shipment to a U.S. address although the part cannot be ordered online with these payment options. Please contact us by clicking on the reference number displayed on the price pane. A. We accept credit card payments through PayPal. Regrettably we cannot accept credit cards through any other methods, such as over the phone or via email. Paypal will sometimes decline payment with certain credit cards, for reasons known only to PayPal. If you experience such situation and are located in the U.S.A. we can accept a mailed paper check. Please contact us. Q. Can I order two or more adapters in a single order? A. Certainly, Build-An-Adapter uses the Shopping Cart functionality so any number of items can be ordered in a single order if your browser is configured to accept "cookies" (most browsers accept cookies by default). Just add your first item to the shopping cart and after the cart content is displayed click the "Continue Shopping" link to return to Build-An-Adapter to design additional parts. The items you put in your cart are saved until the order is placed. Items can be kept for several days or until cookies are cleared from your browser cache. A. Our orders and payments are processed directly by PayPal. PayPal is one of the safest and most trusted payment system worldwide. Your personal information (including credit card data if paying with a credit card) is only known to PayPal. PayPal only shares with us the personal information needed to fufill your order, essentially your name, shipping address and email. Q. Does your web site store cookies in my computer? The items in your shopping cart can be kept for several days, until you place the order, or until the cookies in your computer are cleared. You can of course also remove items manually from your shopping cart at any time. Q. My organization is not able to order online. Do you accept a Purchase Order? A. Certainly, we do accept Purchase Orders in US$ for shipping within the USA. Just let your purchasing agent know the reference number(s) you wish to order, together with the price(s) displayed online on the Build page. This is the only information we need on the Purchase Order. We do not charge sales tax. Payment with a mailed paper check is acceptable. Domestic shipping is free. We recommend emailing the PO to us at address payment@preciseparts.com. We will then immediately email a formal invoice in PDF format and provide a firm ship date for your order. Please note that if your organization is able to pay by credit card we suggest placing the order online as this is easier and faster than emailing us a purchase order. Please ask your purchasing agent to access Build-An-Adapter and select the Telescope Side and Camera Side connections and the desired length for the adapter you need. We will gladly assist your agent over the phone if he or she supplies a Build-An-Adapter reference number. But please note that all our reference numbers are dynamically generated and therefore unique and we we are not able to process an order offline, ie. over the phone, based solely on a reference number unless the number is specified as an item in a Purchase Order. Q. How do you confirm you received my order? A. We automatically email an order acknowledgment, and provide a firm ship date, soon after receiving your order. Online orders are generally confirmed within minutes, 7 days a week, 24 hours a day. Our confirmation email is sent from email address payment@preciseparts.com to the address supplied in the [PayPal] payment record. If you cannot locate the confirmation email please first check your junk or spam folders for lost messages. You may also want to verify your email client and email server filter settings as so-called "spam filters" are by far the most common cause of undelivered emails. Incidentally, certain email services are notorious for preventing legitimate emails from being delivered based on criteria only known to these services. Q. Do you take orders over the phone, or via email? A. No. Since all our products must be designed online to fit specific applications we are no able	to take orders over the	phone or by email. However we can certainly help you place an order online but first please be sure to have all needed information and requirements at the ready as regrettably we are not able to assist with equipment and devices questions. Q. When do I get my custom adapter if I order it today? A. Turn-around at any given time is based on our current backlog and we always strive to provide a reasonable delivery time. We currently can have parts shipped within 10 business days from the order date. We email an order confirmation and a guaranteed ship date within 2 hours of receiving an order. Please contact us for special requirements indicating your order number. Q. Do you have an extra charge for quick delivery? A. No, but if you have an emergency we will do our best to prioritize your part. In such circumstances we recommend selecting the fastest shipping option at time of order AND let us know when you need the part. We will then do our best to take your requirements into account when we schedule the order for production subject to our current work load. Please contact us with your requirements via email, indicating your order number. Q. How can I select a shipping method? A. Either Standard Priority Mail or Express Mail can be selected at checkout on the payment page after choosing the method of payment. Please do not use the "Estimate Shipping" button offered by PayPal on the initial "Shopping Cart" page as the amount shown may be inaccurate. We can also ship UPS upon request, either domestic or international. Please add a note to that effect on the order page, or email us how you want the part shipped but please be aware that additional shipping charges will apply. We will email a quote for the price difference to the address supplied in the order record. Q. I am located outside the USA. How do you ship internationally? A. We ship worldwide with either United States Priority Mail International or Express Mail International (see also this answer). We can also ship UPS World Wide upon request. Please be aware that depending on the destination country there may be taxes, duties, or VAT due at delivery. Although we have no control over the import regulations specific to each country, we do try to minimize destination charges by clearly marking our packages with the customs classification code for astronomical telescope accessories as these products generally benefit from favorable tax treatment. Special note for United Kingdom destinations: we recommend closely following the progress of the shipment after it arrives in the UK as a number of our packages have been held in customs awaiting payment of charges without the recipient being notified. Q. I did not get a shipping notice. A. We automatically email a ship notification and tracking number as soon as the order is packed and leaves our facilities. The shipment notice email is sent to the address supplied in the [PayPal] payment record, and is sent from email address shipment@preciseparts.com. If the email is missing please first check your junk or spam folders for lost messages. You may also want to verify your email client and email server filter settings as so-called "spam filters" are by far the most common cause of undelivered emails. Incidentally, certain email programs are notorious for preventing legitimate emails from being delivered based on criteria only known to them. Q. What material are the parts made from? A. All adapters are made from high strength 6061 aluminum and anodized smooth black. Internal surfaces are finely ribbed and treated with an anti reflective layer. Dust caps are made of black Acetal, a tough engineering plastic. The edge of the cap is knurled if room allows. Q. Can you make parts in volume? A. PreciseParts specializes in making one-of-a-kind components essentially one at a time. This is where we believe we can best serve the astronomy community. Although we can generally make two or three units for a reasonable price, we would suggest contracting with a production machine shop to make parts in higher volume at an optimum cost. We can also prototype a part, for example to test design iterations. The availability of a prototype can then substantially facilitate dealing with a production shop at a later time. Q. At what level of precision do you machine parts? A. Our machining tolerances depend on the particular feature. For example some threads require a larger allowance than others to ensure our adapters will fit in all circumstances. We generally machine adapters to a maximum of +-0.001 inch (+-0.02 mm) differential thickness (aka "wedge" error), and better than plus and minus 0.005 inch (plus and minus 0.1 mm) for effective length. Q. Can I return the part if it doesn't fit? A. We stand behind our design and will promptly replace or rework a custom adapter if it does not fit either or both devices the part was ordered for, or if the part length does not match the effective length ordered. Please see also our warranty statement here. Q. What kind of warranty do you offer? A. We will replace or rework a custom adapter if it does not fit either of the devices the adapter was ordered for, or if the part length does not match the effective length ordered, within a reasonable tolerance commensurate with the application. All the parts we make are unique and machined exactly according to the customer created design, and this unfortunately precludes any return. All sales are therefore final unless the part is defective as defined above. Please note that we cannot warrant that the part will fit a particular purpose or a specific instrument setup, and we expect our customers to assume full responsibility that the adapter morphology and the length as ordered are appropriate for their application. We also cannot anticipate all possible interferences between two devices interconnected by our adapters, therefore it is the customer responsibility to verify before ordering that equipments installed in close proximity will not interfere with each other. The part's 2D drawing and 3-D rendering available on our site are useful for verifying possible interferences. Any claim for replacement or repair must be made within 60 days of order date. Disclaimer: Many devices share similar designations but have different specifications, and to ensure you are selecting the correct devices please always verify the adapter scale drawing displayed on the left side of the price page to ensure the general features match the equipments the adapter is intended for. If an order is placed using a browser that cannot display the drawing we will not warrant the design therefore the provisions outlined in this paragraph become null and void. If your browser cannot display the drawing, please check this answer. A. We DO NOT share ANY of your personal information, including email address, shipping address, phone numbers, browsing history, and order record, with any other party unless you explicitly authorize us to do so. If you use a credit card to pay for an order, the credit card number and associated information is only available to PayPal and is not communicated to us. We will never ask for your credit card information over the phone or via email. We do not require users to open an account or register in any way to use our service. Our pages are free of advertising and we will never try to sell you anything other than the products we directly make. Our web pages do not include any social networks links or buttons, such as Facebook "Like", or Tweet, to prevent possible tracking of your browsing information by unrelated third parties. If you wish to contact us, you can find our contact information here. Comments or feedback can also be left on that page, even anonymously, but if you wish to include your email address we will be glad to reach back.